Identification: Hindwings have long tails. 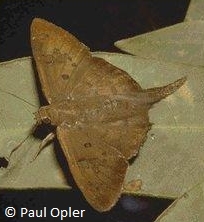 Wings are brown; forewing with 2 submarginal spots near the rear of the wing. Underside of forewing has a dark brown spot near the base. Males have a costal fold enclosing scent scales on the leading edge of the forewing. Wing Span: 1 3/8 - 1 5/8 inches (3.5 - 4.1 cm). Life History: Adults perch upside down on the undersides of leaves. Caterpillars live in leaf shelters and feed on leaves. Flight: Many broods from April-October in Mexico; June-July and October in South Texas. Caterpillar Hosts: Tree legumes Amerimnon and Ichtyomenthia. Range: Peru north to Mexico. Strays north to the lower Rio Grande Valley, Texas. Conservation: Not necessary for rare stray.